Two weeks before the end of the 2003 Drum Corps International tour, the Blue Devils broke the Cavaliers’ 64-show winning streak that spanned August 2, 2001 to July 26, 2003, on way to winning all three nights of World Championship competition at Orlando’s Citrus Bowl Stadium. Further down the competition, just 1.60 points separated the 11th through 14th place corps in the Quarterfinals, and two points separated those same placements in the Semifinals. Spirit managed to knock the Blue Knights out of the Finals competition, while both the Madison Scouts and Carolina Crown returned to the top 12 after falling out the year before. 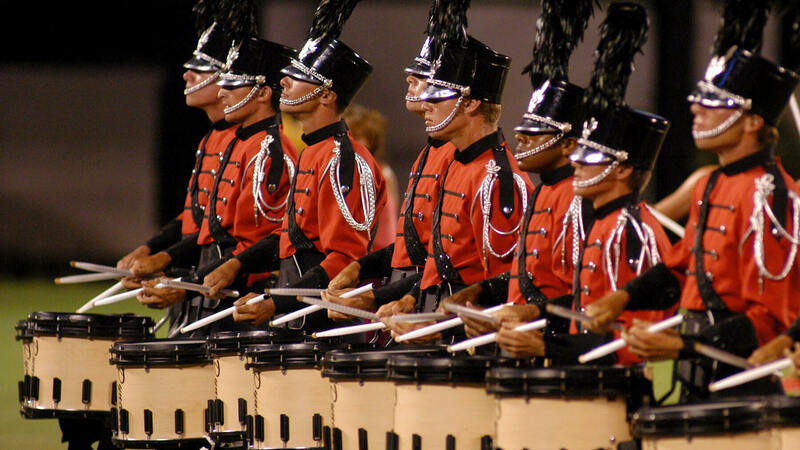 The Boston Crusaders' sixth-place 2003 production was titled, “Bravo,” a collection of hot Latin works floating amidst a sea of vibrant shades of red in the flags and color guard costumes. The opening fanfare was based on “Boléro,” the famed 1928 work by Maurice Ravel (originally titled “Fandango”) that was utilized as the corps’ opener in 2000. The fanfare proceeded into “Danzas de Pasión (Dances of Passion),” an original composition by brass arranger Jay Kennedy and percussion arrangers Rich Viano and Jerry Carpenter. The work was a series of Spanish melodies woven into a set of intensely hot-blooded symphonic dances. In the midst of the first movement of the selection, the front ensemble percussionists could be heard playing a theme from “Spanish Fantasy,” a work that would appear later in the show. And toward the end of the second movement, the corps’ iconic brass stabs from “Conquest” made an appearance. What at first seemed to be a third movement quickly turned into an introduction to “La Oración (The Prayer),” with a hint of the melody of the corps’ 2000 rendition of “Time to Say Goodbye” performed by the mallet instruments and a lone backfield trumpet. Before proceeding with the tune, the horns formed a diagonal cross to enhance the change in emotions. Accompanied by long pink and yellow flags, the brass players milked the melody with crescendos and dramatic short pauses, as if it was actually being sung. At one of the emotional climaxes, a snare drum played the repetitive rhythm to “Boléro,” and at the end, the front ensemble brought back the hint of “Time to Say Goodbye” from the 2000 show. Another horn line salute to the corps’ signature “Conquest” theme kicked Ernesto Lecueno’s “Malegueña” into overdrive, the interpretation largely original, with a bit of an homage to Bill Holman’s arrangement for the Stan Kenton Orchestra’s 1962 “Adventures in Jazz” album. The work was woven into Chick Corea’s “Spanish Fantasy,” from Corea’s 1976 “My Spanish Heart” album. Fluorescent lime green flags with red slashes popped out, and for the last two minutes of the show, the music went through a variety of loud dynamic levels. A mock battle scene amongst the horn players in a block up front led into short statement of the climactic ending of “Boléro,” while three giant solid red flags were brought out, one centered on the field and the other two spun from the two outer drum major podiums. At the end, the brass players and guard members collapsed on the field, as exhausted as the fans were watching the incredible performance put before them. For this week only, you can save on the DVD set that contains this complete Boston Crusaders performance, along with all finalists from the 2003 DCI World Championship. Buy the 2003 DCI World Championship DVD set. Discount DVD offer ends Monday, September 7 2015.